1 Who is Jeb Bush’s wife, Columba Bush? 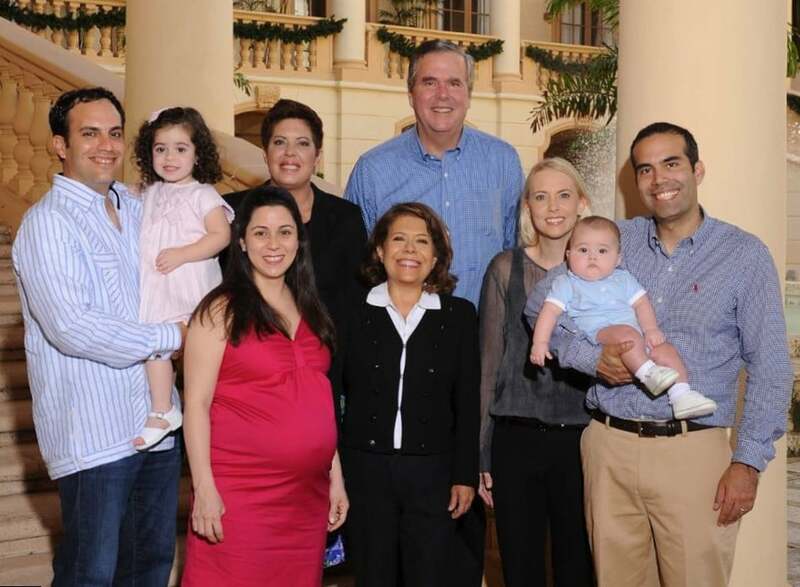 Who is Jeb Bush’s wife, Columba Bush? Born Columba Garnica Gallo on the 17th August 1953, in Leon, Guanajuato, Mexico, she came to prominence as the wife of former Florida Governor Jeb Bush, and so as the First Lady of Florida during Jeb’s mandate. The youngest child born to José María Garnica Rodríguez (1925–2013), a waiter from Arperos, Guanajuato, and Josefina Gallo Esquivel (born 1920), from León; her parents married in early 1949 and waited for four years on Columba. However, just three years after Columba’s birth, her father left the family, and the two divorced in 1963. Columba has an older brother, Francisco Jose Garnica, and an older sister, Lucila del Carmer Schmitz. Columba received her high school education at Instituto Antonia Mayllen, a private Catholic school located in the historic center of Leon. The two met in 1970 when Jeb was 17 and Columba was a year younger; Jeb was a part of a class at Andover named Man and Society, through which he was sent to Mexico to help build a school in the small village Ibarrilla, and also taught English as a second language at Columba’s school. Though she didn’t know a single word of English, Columba and Jeb started a relationship, and four years later the couple’s wedding was held in Austin, Texas at the chapel in the Catholic student center on the campus of the University of Texas, actually in the Spanish language due to her still relatively poor English at the time. Five years after their marriage, Columba became a naturalized U.S. citizen. Wishing the happiest birthday to my amazing husband! Before Jeb became the governor and Columba the First Lady of Florida, Jeb was in the real estate industry, entering his first gubernatorial elections in 1994, but losing to Lawton Chiles by less than two percent. Encouraged by his success in the first campaign, Jeb ran again in 1999 and this time was victorious, subsequently servingd as the 47th Governor of Florida from 1999 until 2007, with Columba his First Lady. She concentrated on philanthropic activities during those eight years, such as serving as an advocate for Florida Coalition Against Domestic Violence, the Center of Addiction and Substance Abuse, while also promoting the work of Arts for Life, which is a group that helps young artists by awarding scholarships. Furthermore, she promoted the works of Salvador Dali, Frida Kahlo, and Diego Rivera, and visited shelters, held numerous art exhibitions, and was part of a delegation that went to Rome for John Paul II’s 25th anniversary as Pope, at St. Peter’s Basilica. She remained out of politics for the most part, but in 1988 during George H.W. Bush’s presidential campaign, Columba gave a speech in the Spanish language, at the Republican National Convention in New Orleans, and most recently in 2016, during her husband’s presidential campaign, Columba visited women’s shelters in Iowa and New Hampshire. At the Basilica with @jebbush to celebrate with Pope Francis in prayer and witness an historic event. Columba and Jeb are parents to two sons, and a daughter. Their eldest child, George Prescott Bush was born on the 24th April 1976 and now serves as the Commissioner of the Texas General Land Office, and has also been involved in the US Navy, real estate, and politics, having obtained a Juris Doctorate degree from the University of Texas School of Law. Their second child, daughter Noelle Lucila Bush was born on the 26th July 1977, and is currently working for a software company with headquarters in Orlando, Florida; she obtained a degree from Tallahassee Community College in 2000, and the following year continued her education at Florida State University. Their youngest child, John Ellis Bush, Jr, came to this world on the 13th December 1983, and has been involved in real estate as he works for a Miami commercial real estate firm. He graduated with a BA degree in Latin American Studies from the University of Texas at Austin. Their two sons have two children of their own, which makes Jeb and Columba grandparents four times over. Columba was raised as a Roman Catholic, and has joined the international Catholic Movement, Regnum Christi – she and Jeb were a part of the Regnum Christi Family Convention held in Atlanta in 2007. Dedicating her life to philanthropy, Columba has earned respect from a number of people throughout the world. She has managed to expand her popularity to social media networks, primarily Twitter, on which she has more than 5,000 followers. She is also quite active on Instagram, on which she has posted pictures of herself and her family, but also her most recent endeavors. She has over 1,200 followers.